The science fiction of the "golden age" is consistently written under two fundamental shaping assumptions. The first is that the then-new state of extremely rapid scientific and technological change ("advancement") would be permanent: i.e., the future is always by nature "more high-tech" than the present (and "more high-tech" is a unified, easily recognized thing needing no definition or explanation). The second is that the social structures and behaviors that developed in the white American middle and aspirational classes at around this same time would also be permanent, and either were or would become universal. The contradictions between these assumptions did not seem to bother most writers (or readers), nor did that between the extremely short (a)historical memory they are founded on and the extremely long historical projection of the science fictional endeavor. Of course many individual stories posit deviations from one or the other of these assumptions (the occasional story of technological "stagnation" or "regression"; or think of the different planetary social structures reflected in the titles of Asimov's novels The Caves of Steel and The Naked Sun), but these deviations are most often superficial and/or limited to one arena, leaving the rest unaffected (claustrophobic or agoraphobic, Asimov's men and women relate to one another in essentially the same way). And much of the time they are presented specifically as deviations: their interest lies in the fact that they are departures from what we can safely assume to be the norm. Contemporary SF, at least of the kind that is taken seriously in the part of the field that Strange Horizons and Aqueduct Press live in, tends to pride itself on its sophistication: it does not make these assumptions, it contextualizes social relations, it interrogates concepts like "high-tech" and "progress." (A self-image reinforced by the vigorous denunciation of this same putative sophistication in other parts of the field.) Depending on whom you ask, this sophistication arrived at different points: with the New Wave (whatever the person using the term means by it), with cyberpunk, with the feminist SF of the 1970s. While I don't buy into the simplistic periodization and opposition such narratives set up (itself a narrative of linear progress that makes quite a lot of unstated assumptions of its own), they do attempt to describe a real shift, and of the various claims I just mentioned the one I for one find most persuasive by far is the one for feminist SF. So why do I begin a review of a book published by a feminist press in 2015 by talking about the unexamined assumptions of this older school of science fiction? Simply put, it's because The Weave, though it positions itself in this theoretically more sophisticated school, is startling in its resemblance to those older works. I first noticed this on the sentence level, the word-by-word writing, which is perhaps a bit more traditionally felicitous than the average '40s SF story but is otherwise practically identical—even down to specific phrases, as when we're told that the large quantities of valuable substances in a planetary system "had led some wag to name the prime star El Dorado" (p. 58). (Yes, El Dorado.) The stories of writers like Asimov and Clarke are full of these anonymous wags, waggishly providing—excusing?—the language the writers want to use to describe their creations. I don't want too much to rest on this one example; I'm talking about a pervasive feeling, which is of course difficult to cite, arising from nearly every line. And it's not just a matter of word choice, or the sort of palling-around atmosphere the language creates. There's a broader conceptual continuity here, from offhand and relatively trivial moments like a quick (and frankly facile) "extrapolation" of art into the future—a novelist "whose language inventions included the great dead languages and the key modern ones and made Finnegans Wake look comprehensible by comparison" (pp. 73-74)—to the most fundamental philosophical and political underpinnings of the novel. All this said, I am an avowed lover of the American magazine science fiction tradition (though not—I hope—an uncritical one). And I'm not one to demand novelty-for-novelty's-sake, to believe that writers, like entrepreneurs, must constantly "innovate" to create "value." So I often found myself wondering why it was that I found The Weave so persistently unappealing. The objections I have to its politics, which will take up quite a lot of space in this review, surely contribute, but they aren't a sufficient explanation—after all, the bulk of the SF tradition I love has politics even clumsier in execution and far more abhorrent. So what's different here? What, to be frank, is worse? 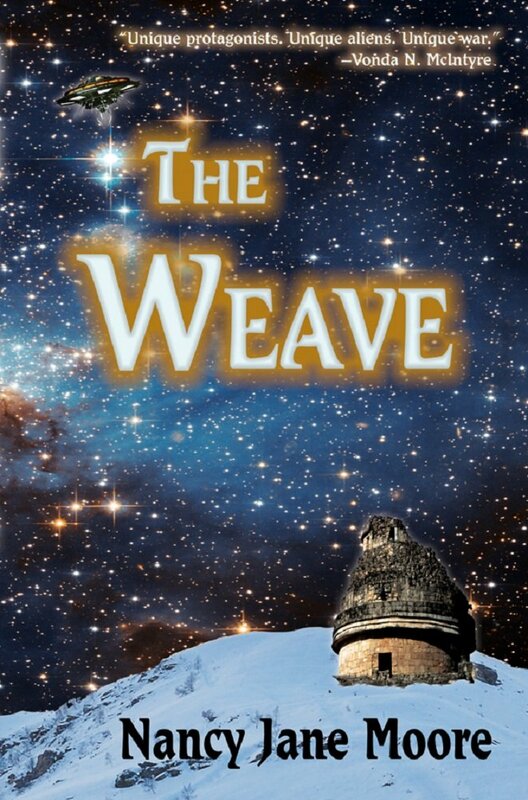 The Weave is a story of contact and conflict between two societies: the ravenously imperialist-capitalist military wing of twenty-fifth-century humanity (I may be describing this in slightly different terms than the book would prefer) and the "Cibolans," a telepathic alien species from a planet ("Cibola"—yes, Cibola) in the so-called "Doradoan" system. These aliens have no verbal language, communicating instead via telepathic exchange of images—there are some nice scenes of mutual bafflement where the Cibolans are as bewildered by the idea that humans communicate with sound of all things as the humans are by the idea of honest-to-goodness telepathy. All Cibolans are bound together in the "weave" of the title, a worldwide telepathic network in which all are intimately linked but in which each retains its individuality, and from which it can shield itself for privacy—it's a sort of friendlier, non-coercive version of Octavia Butler's Pattern, though violence and manipulation are possible (even fairly common) through it and we do hear about past attempts to use it as a tool of control. It is this mental power that the Cibolans will use to resist when the demands of the humans become violent. This all sounds very promising, but the problem in the execution is that the book simply lacks commitment to what it creates. This problem is so pervasive that it is difficult to know where even to begin in discussing it. I spoke before about the assumption in older SF that the social behavior of midcentury white America was universal and permanent. In The Weave we find that the humans of over four hundred years from now all behave identically to today's bourgeois and military classes: they bring flowers and champagne in ice buckets to celebrate romantic anniversaries, they engage in a queasily familiar form of friendly-serious rivalry between military branches; even the politics of academic life are essentially the same as they are now. The sameness of these people's everyday lives is all the more inexplicable for the fact that Moore has them living in a solidly multicultural (or rather, melting-potted) society—though, Firefly-esque, one of the few discernible markers of this is multilingual swearing: people swear in Spanish, Japanese, even French, never in English for anything stronger than "damn" (it sometimes feels as though Moore thought Aqueduct had a Standards and Practices department she had to sneak things past), but there is no sign of any influence from the cultures that speak these languages. And despite the presence of people whose "ancestry" traces back to places all over the world (the narration is obsessed with identifying ancestry, but no one seems to have origins, no one seems to come from anywhere), everyone continues to think and speak in casually colonialist terms that you'd think would give at least some of them pause. They (sorry, "some wag") named a solar system, a planet, and a species after a colonial fantasy, and that's not even close to all of it. It's all well and good to present a society transformed by the mingling of cultures over centuries, but to do so without serious thought about the nature of this transformation produces absurdities, if not obscenities. The same goes for gender: women occupy positions of power in roughly equal proportion to men and there are explicit references to the gender egalitarianism of this world, and yet—for example—our main character, the xenologist and military officer Caty Sanjuro, spends nearly the entire novel managing the emotions of the men in her life, with little or no reciprocation. In a truly gender-egalitarian world, would a man-baby like Masire even be able to rise to the position of power he occupies? Could Sanjuro possibly have any romantic interest in him? Would he even, for that matter, exist? It's entirely possible that the answer to any or all of these questions could be "yes," but if so we need to see how and why, or at least that there is a how and why—because it simply could not work the same way it does now. And unfortunately even the exception I mentioned a moment ago, the telepathy, is not really thought through. I suppose it's all right to simply assert that Cibolans would be "individuals" even though they have this constant natural link from mind to mind and evolved under such conditions, though I have my own doubts about it. A more philosophical book (Russ's And Chaos Died comes to mind) would ask such questions in a way that does not seem to interest Moore—fair enough. But the problem with not being philosophical (in the broadest sense) when approaching concepts so philosophical as the nature of thought is that what you create will almost inevitably be untrue to life as it is lived. Cibolans are capable of telepathically "picking up" everything that passes through a human mind; indeed, they have difficulty not doing so. But because the Cibolans do not possess language, those portions of human thought that are linguistic are incomprehensible to them. So far so good! This is a distinction I for one find interesting and promising, maybe all the more so in the context of the older SF convention of using telepathy in aliens as an easy shortcut to overcome language barriers. It would be one thing if it felt as though the book were trying to put forward the thesis, this is what thinking is, even if I disagreed—as an example, Babel-17's argument about how language works is insupportable but it is an argument and interesting (and, importantly, contestable) as such—but it never feels like anything more than a thoughtless assumption. Then too, though language is incomprehensible to the Cibolans, there is no similar difficulty with "image-thinking"; this is, we're told, how the Cibolans themselves think and communicate, and they understand our images as they do their own. But would this be the case? What is a "thought-image"? Do Cibolans form images the way we do? Do Cibolan eyes work like ours? Do they transmit information to the brain the same way ours do? Does the brain process this information the same way? Are Cibolans culturally trained to interpret visual stimulus the same way? Does recall work the same way? Imagination? And so on. Not all—or any—of these questions have to be answered, but there's no trace in the book of their having been asked. Ancient history, now, but the images had been passed down through the ages. Sundown could almost feel what that time was like. It's as if the book is saying: we've established that anything a Cibolan thinks or "sends" is in images, why bother going into it any further? And so it relaxes into an easy, familiar storytelling mode. Even basic conversations are handled with similar laziness. When Sanjuro meets with the ruler of the Cibolan nation the humans have landed in, she shows the ruler mental images of "human settlements in unoccupied land"—the current plan for colonization. "He [sic] responded that this was unacceptable. She told him she would convey that to her superiors, doing her best to make it clear that she did not make the final decision" (p. 203). Traces of Sanjuro's difficulty in this unaccustomed mode surface from time to time, but otherwise it's as though Moore thinks that by eliminating direct speech and opting instead for summary she has done all that is necessary. But: how did the ruler convey the idea, "this is unacceptable"? "She told him"—how? The novel, rather than truly considering this alien form of thinking and communicating, rather than inviting it into itself and dealing with it, being changed by it, just wants to get it out of the way. On with the story, at all costs! But why, then, come up with this particular alien-ness in the first place? Why gesture toward exploring it without being willing to? You may have noticed that I put a [sic] after the pronoun "he" in the passage I just quoted. If you said "uh-oh," you were right to. All Cibolans are theoretically capable of inseminating and being inseminated. When a couple decides they wish to have a child, they must agree who will take on which (strictly biological) role. And they have no cultural concept of gender. This became obvious to me (if not in all its details) on page two. But the book plays coy with it, all the humans thoughtlessly assigning every Cibolan they encounter one of two gender options, the narration raising few or no objections, for over half its length. Her "discovery" of the Cibolans' genderlessness, on (seriously) page 231, comes as a complete shock to Sanjuro—a scientist trained in the study of the biology and culture of aliens. This is breathtaking ignorance. Depending on how it was handled, it could possibly be justified in a book that posited some kind of scientific backsliding from where we are now. But The Weave presupposes a world in which over four hundred years of linear scientific progress has occurred since today, with (we're told) "social progress" going hand in hand with it. Science knows what it knows now, plus four centuries of new discoveries, and there has been no patriarchal backlash in society. And yet when Sanjuro goes to her friend Kyo, an astrobiologist—a specialist in non-terrestrial biology, who presumably should know that such things are far from unheard of even on earth—who has been intensively studying the local fauna, Kyo's reaction is, first, "You're making this up to screw with my head," and then, once it's started to sink in a little, "I admit it explains why we had so much trouble sexing animals. I guess they don't have sexes either" (p. 294). You admit? You guess? Nothing else in the novel suggests that the expedition to the Doradoan system has been staffed entirely with thundering incompetents (beyond the military leadership, but that's a different issue), so the only possibility left to me is to conclude that Moore is honestly trying to present this shocked disbelief—and, again, this ignorance—as reasonable. It is not. The irony is that the novel pretty clearly means to criticize contemporary concepts of gender, where it in fact more often reinforces them—both in these discussions of Cibolan biology and in the portrayal of human culture, as I noted earlier. (And at this point I'd like to remind you that the Cibolans live in nuclear families.) I keep coming back to the feeling that the novel simply cannot commit to what it creates, that rather than thinking anything through it relies on received narrative forms and readymade assumptions about how things are and would be. This is always dangerous, and considering that this novel chooses to explore such vital, fraught (and intertwined) areas as gender, militarism, capitalism, and imperialism, it's that much more so. Dangerous? In an earlier passage Sanjuro muses on gender, thinking in passing about how in humans it's more complicated than a binary, that there are other genders than male and female (somehow knowing this does not leaven her later shock), and that "not all of them had come about after medical advances allowed intentional alterations" (p. 132). Though it is a (grudging) acknowledgment of the fact that gender variation is intrinsic to humanity and ancient, in its form this reinforces the idea—a plainly false idea often used to transphobic and more specifically transmisogynist ends (not incidentally trans women, and men, don't seem to exist in this future—only cis men, cis women, and other)—that such variation is primarily the product of modern medical techniques and the contemporary medical establishment. That ideas such as these are assumed in this novel of the encounter between an imperialist society and a "native population" that possesses no cultural concept of a gender binary is extraordinarily, uncomfortably close to the real-world history of European imperialism's violent destruction of indigenous gender systems worldwide, a recapitulation made all the more uncomfortable by the fact that Moore seems entirely unaware of it. A book that raises such specters needs to deal with them; this one does not. In her review of the musical Urinetown Erin Horáková, paraphrasing and expanding on something I once glibly tweeted, analyzes the ways in which a work of art, by presenting a political critique that stops just short of where it needs to, or goes awry at just the right (wrong) moments, can present the appealing appearance of opposition while in effect serving to prop up the system it appears to oppose. "In misdefining a problem," she writes, "and/or not offering possible ways to fix a problem while dwelling on that problem in your art, you can just reinforce said problem." We've seen how The Weave's misdefining the problems of gender (and its interface with imperialism and racism) serves to reinforce those problems, and unfortunately both of the failings Horáková identifies attend all of the political problems the novel dwells on. Take militarism. After a brief prologue, the novel opens with a military crackdown on striking miners, in which Sanjuro, misled into thinking she's faced with a coordinated attack, gives the order that results in the wholesale slaughter of workers who, it turns out, were unarmed and non-violent. In the aftermath, the focus is on Sanjuro: she feels really, really bad. Apart from the obscenity of focusing on the pain of the ones who carried out the atrocity rather than their victims, and apart from the obscenity of suggesting that a military crackdown on striking workers would be acting in justified self-defense if the people they massacred were armed, this also accomplishes the neat trick of making it seem obvious that the role of the military is not to inflict violence, while also leaving forever unstated what its role actually is when its purity is not being perverted. After all, what is the purpose of a military in a society that is not under external threat? It can only be imperialism abroad, repression at home, or both. I think most people know this on one level or another, which is why countries like the US and the UK and Israel have to conceptualize themselves as under attack in order to justify the actions, the scale, even the existence of their militaries—recategorizing aggression and repression as defense. In fact Moore herself seems to know it, as imperialism abroad and repression at home are the only things we ever see or hear about her future military doing. And yet somehow this has no bearing on its legitimacy. It's an essentially good, honorable institution that somehow always ends up being tragically misused, through no fault of its own, or at best through the fault of some individual Bad Actors and/or Incompetents somewhere in the hierarchy. Describing the conflict—another internal repression—in which her father was killed, Sanjuro says "It was a stupid war, a bad war, fought for economic reasons" (p. 177), leaving unsaid what other kind of war she thinks there is. In treating stupid, bad wars fought for economic reasons as the exception without mentioning the imagined norm from which the exception deviates, the book silently relegates the idea that the militaries of dominant powers might be fundamentally illegitimate to the realm of the unthinkable. And so what we have is a critique not of militarism or imperialism in and of themselves, but rather of specific bad examples of them, examples which it treats as deviations from a norm that it quietly but powerfully props up. And this conception of the military, combined with a focus on the agency and emotions of its personnel, leads the book to the other pitfall Horáková identifies: that of offering faulty solutions. There is a recurrent fantasy in cultural production that where the power structure is oppressive, it is to the people who actually carry out this oppression—military, police, etc.—that we should turn to protect us. This is especially common in mass media SF: the anti-government FBI agents of The X-Files, the anti-fascist military coups (!) in shows like Babylon 5 and Battlestar Galactica, the captain going up against secret ops in Star Trek [sic] Into Darkness, and so on. And here we see this same fantasy: to be sure, the Cibolans put up an impressive resistance (and in the process provide some of the novel's few honestly satisfying moments), but without individual military officers like Sanjuro following their consciences it's far from clear that they would have been successful. And the overdetermination of Sanjuro's conscience—her father's death makes her ambivalent about the military, having been "tricked" into mass murder makes her ambivalent about the military—carries a whiff of the suggestion that the patent immorality of the military action on Cibola on its own is not enough to justify resistance. The Cibolans are lucky someone already so ambivalent happened to be on the mission! Whether they would have been better off had there been no mission, or had it not been military, the book doesn't want us to ask. In other words, a happy ending in which conquest is avoided and a truce is worked out (and, as the great Vonda N. McIntyre points out in her back-cover blurb, personal friendships are maintained) does not a critique make; and the path the novel takes to get to this resolution reaffirms at every turn the legitimacy of what it appears to criticize. I don't think it does so maliciously, or deliberately, but that it nevertheless manages it so powerfully and so consistently demonstrates once again the failing I keep returning to: its inability or unwillingness to think through what it presents, a failing which is always inexcusable in a work of art but which is all the more so in one that seeks to present a functional political critique. In a rare post about science fiction, Steve Mitchelmore quotes Michael Holland, who says that SF habitually "hangs back from thinking the totality of what it projects." Holland is speaking of something much more fundamental than the "content"-oriented political issues I've been talking about—he continues by saying that this projected totality is "total transcendence in the here and now," and as I understand it his argument is that SF, by (usually) placing itself in the future, presupposes an ability to know beyond the bounds of physical life and death: "Thus there are no tombs in the sci-fi world," Holland writes (Mitchelmore, wryly anticipating the literal-mindedness of the SF fan, quickly interjects: "I think the existence of tombs in a particular novel shouldn't mean Holland is wrong and doesn't understand the genre"). And the bad faith hidden at the heart of SF is its failure to think the totality of this, to understand its implications and approach what it approaches with this understanding. Now, unlike Mitchelmore and (I presume) Holland, I tend to think that this failure is precisely where much of the interest of SF lies. That is, a good science fiction story or novel is, in addition to and intertwined with whatever else it might be, the drama of such thinking's impossibility. But in order for such a drama to take place, there has to be an attempt, and I think what most SF does is to displace the attempt to "think the totality" onto an attempt to think through the concrete ramifications of a set of circumstances—and to find the places where such thinking also must fail. The portrayal of aliens is a good example. For all that I complained about the Cibolans' too-close resemblance to humans, it is of course impossible for a human writer to create a truly alien alien. But most of the best science-fictional aliens—everything from Clarke's absent Ramans to Brissett's overwhelmingly present krestge—are, in a literary sense, this impossibility. And by so being, they become one player in the drama. And this, I think, is the foundational problem with The Weave: it simply lacks the imagination to make this attempt, to incorporate its failure into itself and through it find a way to something approaching truth. Indeed this poverty of imagination, this disinterest in trying to portray a future that seems like a future or an alien that seems like an alien, coupled with the attempt it does make toward political critique and the particular ways it falls flat in this attempt, suggests to me that the novel's real interest is not in the loftier imaginative possibilities of science fiction but—as is the case with so much SF—in wishful thinking. That is to say, it draws from the resources of science fiction only to enable it to present a case of imperial first contact that goes better than those in actual history, simply because Wouldn't it be nice? But because of its inability to break with a capitalist, imperialist imagination, its wishful thinking not only remains just that but also takes on a pretty unfortunate form in itself. Indeed, in The Weave we're faced with something like the worst of both worlds in the imperial imagining of nicer outcomes: we have both the individual Good One who saviors the day and "wouldn't it be nice if the natives had been able to save themselves?" asked in such a way as essentially to absolve us—whoever the asker conceptualizes as comprising that us—of responsibility. I started out comparing this book to older SF, the works written under the assumptions that technology always progresses and that social norms never change. I was puzzled as to why so many works based upon these flawed and harmful assumptions can mean so much to me, where this book—that otherwise feels so much like them—was so unpleasant. An easy answer would be to say that the older works are, precisely, older: the damage has been done, they already exist, have already had their impact, so why not enjoy them; meanwhile the books currently coming out need to be held to a higher standard to be sure they don't continue perpetuating the same damage. Easy, but unsatisfying—both because the difference feels more immediate than this kind of min/max calculation and because the calculation is so flawed in itself (if there's anything the SF world should have had hammered home by the past couple of years it's that the damage is ongoing). A better answer, or at least the beginning of one, might be that in older SF these assumptions are the baseline from which the writers pursued other interests, ones that had never been followed before, at least not like they were doing. For all its many problems, there's a sense of creation, a sense that if things are often awkward and stupid it's because it's the work of people who are feeling it out as they go, making something for which there are only partial models, if any. Even when it's not at its best there's a sense that the writer might stumble, almost or actually by accident, into something new, a sense that at any moment something great might happen—and sometimes, just sometimes, something great does. The Weave, on the other hand, is written with the certainty of someone who knows exactly How Things Are Done and just does not ever think to question it. Where older SF works made mistakes, this one repeats mistakes, as if by rote. And at the same time (remember Horáková) by presenting the appearance of questioning assumptions it in fact holds to, by "subverting tropes" it retains as tropes, it reinforces them: recapitulating them under the guise of critique, it makes them all the more difficult to counter by giving the appearance of already having countered them. In this it is like many works in the supposedly more sophisticated contemporary SF field. But there are works out there that are not content to repeat mistakes, that don't just follow established paths and assume that everything will work out fine—ones, even, that might make their own mistakes from time to time on their way to where they need to go. Even just in the year before it published The Weave, Aqueduct singlehandedly published a good many of them: off the top of my head I can think of Jennifer Marie Brissett's Elysium, Sarah Tolmie's The Stone Boatmen and NoFood, and, though it's working in different forms (essays and plays), Andrea Hairston's Lonely Stardust. Obviously it's unlikely that any publisher could maintain that level on a totally consistent basis, and equally it's likely that, had I not had such high hopes for it, The Weave would have felt less disappointing. Nevertheless, its problems remain and are real.